Your baby will look like a teddy bear come to life in this adorable infant lil bear costume! It comes with a plush polyester jumpsuit, a headpiece with ears and a soft rainbow-striped blanket. The jumpsuit is a medium brown color with a yellow patch over the belly and bottom of the footie's. The feet also have bear paw-prints sewn on with grips to prevent slipping. A blue bow decorates the neckline with plastic snap closure down the back and on the insides of the legs for quick diaper changes. The headpiece is lined in yellow fabric and fastens with plastic snaps under the chin. The blanket is soft blue on one side with stripes of rainbow mesh on the other. 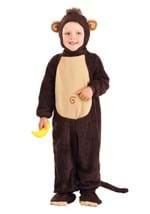 Be sure to check out all of our super cute baby animal costumes!